Our 2015 Patron Drive raised over $106,000! 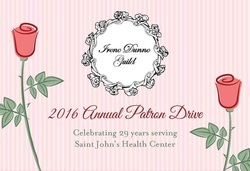 Since inception, our Annual Patron Drive has raised over $1,000,000 to fund and maintain many exceptional projects and upgraded equipment at Saint John's. The drive is a letter-writing campaign from Guild members to their friends, family and associates in the community requesting donations. Note that all funds raised in this drive go directly to program costs and no portion is used for administration costs of the Guild. Snacks distributed to hospital staff in recognition of their efforts and delivery of compassionate care. Books, DVDs and CDs for patient use and waiting room magazines throughout the hospital. Guild members purchase a number of toys and activity kits for distribution to children accompanying loved ones in the ER.